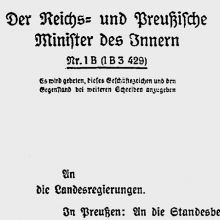 After 1933 the Nazi state’s actions were based on the doctrine of racial ‘superiority’ and ‘inferiority’ and the classification into ‘Herrenmenschen’ [‘members of the master race’] and ‘Unter­menschen’ [‘subhumans’]. 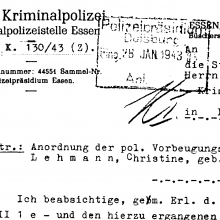 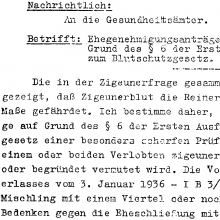 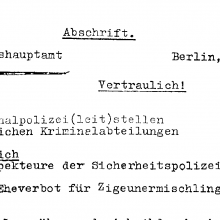 Like the Jews, the Sinti and Roma were declared to be ‘artfremde Rassen’ – literally: races of a different species or ‘racially foreign’ – and were therefore excluded from the ‘Volksgemeinschaft’ [‘people’s community’]. 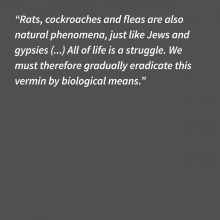 This policy of exclu­sion and disenfranchisement was bolstered by state-controlled propaganda, which deliberately disseminated demonising images. 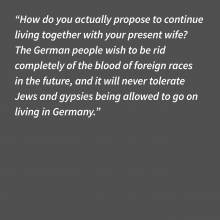 The Sinti and Roma, like the Jews, were subject to the discrimi­natory provisions of the Nuremberg Laws. 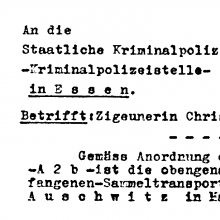 They were declared second-class citizens by the Nazis. 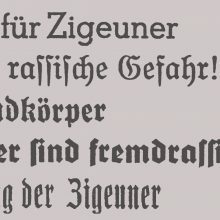 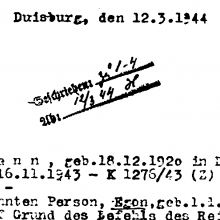 Any ties between ‘Zigeuner’ [‘gypsies’] and ‘Deutschblütige’, i.e. 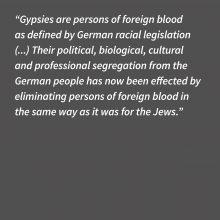 persons of German blood, were branded as ‘Rassenschande’ [‘miscegenation or racial defilement’] and subject to severe punishment.